7-month-old girl dies in Lakeville Highway crash in Sonoma Co.
SONOMA CO, Calif. -- A 7-month-old girl died after a three-vehicle collision Thursday night on Lakeville Highway in Sonoma County, the California Highway Patrol said. Several children, including a 3-year-old girl, who were riding in a 2016 Ford Explorer were critically injured in the collision, and they were taken to hospitals in Santa Rosa, Petaluma and Oakland, the CHP said. The CHP was informed around 8:10 p.m. of a head-on collision on Lakeville Highway at Old Lakeville Road #2 involving three vehicles. An 18-year-old Granite Bay man was driving a 2005 Volkswagen Jetta north on the highway when it crossed the solid double yellow lines and collided with a southbound 2016 Ford Explorer driven by a 31-year-old Folsom woman, the CHP said. 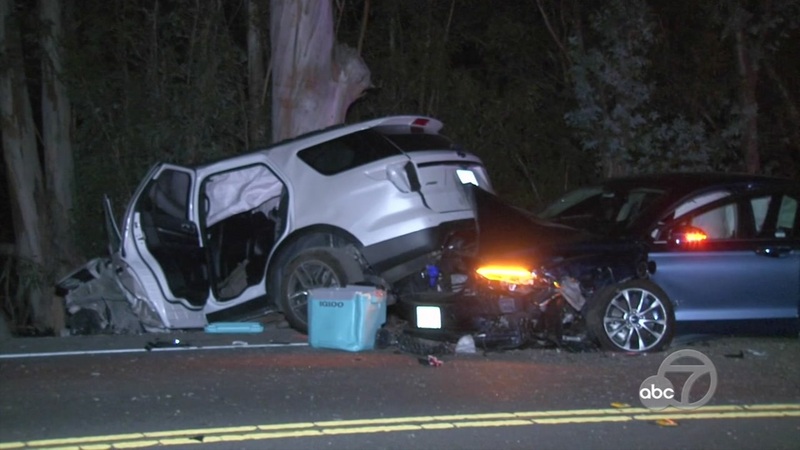 The Explorer was thrown to the right, left the highway and collided with a tree, and the Volkswagen spun out of control and hit a southbound 2018 Ford Fusion driven by a 25-year-old Fairfield man, the CHP said. The Sonoma County coroner's office notified the CHP that the 7-month-old girl who was taken to Petaluma Valley Hospital died of blunt force injuries. The collisions closed Lakeville Highway for four hours and the incident is still under investigation, the CHP said.